- Ahh missiles, we all love them right? Letting rip a blazing rocket with the satisfied knowledge of one less target to worry about. They’re a staple in many video games, (happy memories of Afterburner in the arcades!) but did not appear in Rogue Star. Why? Let’s chat about missiles and later their implementation so far in Rogue Star ACE. 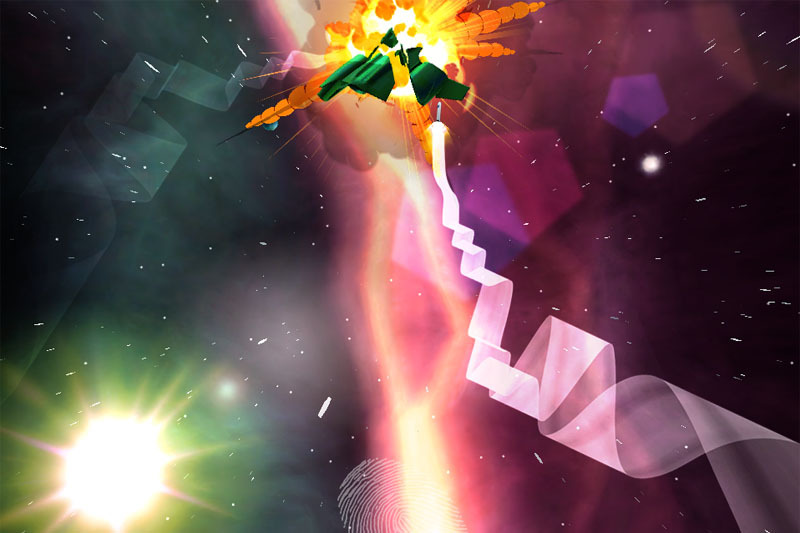 When Rogue was being designed, missiles were initially implemented and play tested. After a point however it became clear that their mechanics (for a smartphone game) provided several obstacles. Small screen sizes meant it was difficult to target enemies. The inclusion of missiles made the game too easy and superseded the close-up dogfight mantra of Rogue’s design. Adding design mechanics to limit missiles effectiveness adversely impacted the release schedule, together with the necessarily increased play testing time. Let’s deal with these issues in more detail. Screen size is an important factor, which Rogue Star’s design was heavily invested in solving. One of the title’s main challenges was to breakdown and simplify, a notoriously complicated genre to work on touchscreen devices. However, the targeting of multiple ships was severely hindered by the screen sizes of phones of the era. Remember, the iPhone 4 had only just come out at this point. Missiles, by their very nature, offer a quick fix for players. This can be very welcome in many cases and give players a safe way out of a dangerous situation. Along with a nice visual explosion bonus! However, in my experience they can be abused in games to the detriment of the all important fun factor. Simply flicking a switch to kill an enemy can soon become tiresome. I always want a fun, challenging mechanic behind design features. Missile testing circa 2011. Where does the time go!? The mechanics I designed to solve this problem were implemented in a test level and it quickly became apparent of the ‘can of worms’ I’d be opening. All of a sudden, the complexity of the feature increased tenfold. Speeds, distances, evasion, counter measures to name but a few. All of these though paled in comparison to the god of game development, bug/playing testing. It’s all too easy to underestimate quite how time consuming this can be and continue to chase the rabbit down the hole! Now we come to Rogue Star ACE. Firstly we can immediately say that the screen size issue has been cleared up. The Switch’s much larger screen, along with its docked feature, mean that fiddly targeting can be solved. Mention should also be made of the numerous physical buttons which will also greatly help in this regard. The intervening time period has also enabled me to refine my missile implementation into a more elegant solution. So let’s get down to the functions of missile gameplay mechanics. I’ll go into greater detail in this in part 2, but as I stated above, my vision is always to include a fun mechanic along with any new feature. 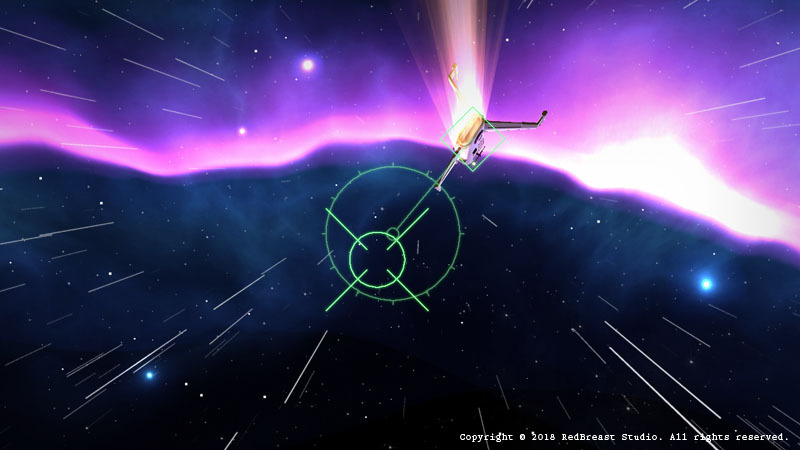 For missiles, this involves the player needing to manoeuvre their craft to maintain a ‘lock’ on their target. Furthermore, the lock is heavily biased towards a specific part of the target ship, its engines. This means the player would need to gain a good rear angle on a target, whilst also dissuading too many speculative frontal shots, since these will have a significantly decreased probability of hitting. Missiles live, chasing down a Trident! This shot gives a glimpse of the targeting in action. I’ve cleared the rest of the screen’s interface (more secrets to reveal later!) GUI, but it does show ACE’s new nebula graphics. As you can see, there are 2 separate indicators. I’ll let you speculate as to how these tie into the lock on mechanic. What have been your experiences of missiles in games? Do you think they should be fire and forget? How many do you think you should be allowed to carry? Comment down below and let me know what you think. Until next time pilots!